Australia has joined 44 other nations at the UN human rights council in condemning growing political violence and repression in Cambodia ahead of elections there this year. Environmental destruction and landgrabs could lead to governments and individuals being prosecuted for crimes against humanity by the international criminal court following a decision to expand its remit. The UN-backed court, which sits in The Hague, has mostly ruled on cases of genocide and war crimes since it was set up in 2002. It has been criticised for its reluctance to investigate major environmental and cultural crimes, which often happen in peacetime. In a change of focus, the ICC said on Thursday it would also prioritise crimes that result in the “destruction of the environment”, “exploitation of natural resources” and the “illegal dispossession” of land. It also included an explicit reference to land-grabbing. The court, which is funded by governments and is regarded as the court of last resort, said it would now take many crimes that have been traditionally under-prosecuted into consideration. The ICC is not formally extending its jurisdiction, but the court said it would assess existing offences, such as crimes against humanity, in a broader context. Land-grabbing has become increasingly common worldwide, with national and local governments allocating private companies tens of millions of hectares of land in the past 10 years. The anti-corruption campaigners Global Witness say this has led to many forced evictions, the cultural genocide of indigenous peoples, malnutrition and environmental destruction. “Land-grabbing is no less harmful than war in terms of negative impacts on civilians”, said Alice Harrison, an adviser at Global Witness. “Today’s announcement should send a warning shot to company executives and investors that the environment is no longer their playground. International lawyers said broadening the priority cases to include land-grabbing would recognise that mass human rights violations committed during peacetime and in the name of profit could be just as serious as traditional war crimes. “It will not make land-grabbing per se a crime, but mass forcible evictions that results from land-grabbing may end up being tried as a crime against humanity,” said Richard Rogers, a partner in the international criminal law firm Global Diligence. Rogers has lodged a case with the ICC on behalf of 10 Cambodians alleging that the country’s ruling elite, including its government and military, has perpetuated mass rights violations since 2002 in pursuit of wealth and power by grabbing land and forcibly evicting up to 350,000 people. “Cambodia is a perfect example for this new ICC focus. It fits in to the new criteria,” he said. The new ICC focus could also open the door to prosecutions over climate change, Rogers said, because a large percentage of CO2 emissions had been caused by deforestation as a result of illegal land-grabbing. The ICC can take action if the crime happens in any of the 139 countries that have signed up to the Rome statute, if the perpetrator originates from one of these countries, or if the UN security council refers a case to it. Crimes must have taken place after the Rome statue came into force on 1 July 2002. Reinhold Gallmetzer, a member of the ICC working group who drew up the policy document, said: “We are exercising our jurisdiction by looking at the broader context in which crimes are committed. We are extending the focus to include Rome statute crimes already in our jurisdiction. The ICC paper also lists other crimes, such as arms trafficking, human trafficking, terrorism and financial crimes, in which it intends to provide more help to individual states to carry out national prosecutions. After taking a relative drubbing during 2013 elections, when the ruling Cambodian People’s Party (CPP) won only 68 of the 123-member parliament’s seats, the government headed by Hun Sen, is now trying to silence the opposition. Fearing a worse election result, Hun Sen is determined to intimidate the opposition stay in power after community and general elections scheduled for 2017 and 2018, respectively. A review of recent reports by Human Rights Watch makes for a grim reading. “Cambodia became engulfed in a human rights crisis after national assembly elections,” the human rights watchdog wrote about events unfolding in 2013. 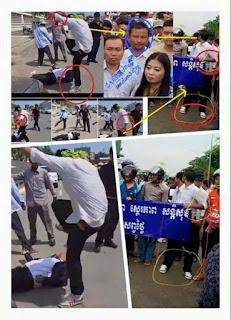 The upper echelons of the Cambodia National Rescue Party (CNRP), the main opposition, have unsurprisingly been attacked. Last November, a court issued an arrest warrant for Sam Rainsy, the party’s president, who stands accused of defamation in a case dating back to 2008, when he claimed that Foreign Minister Hor Namhong used to run a Khmer Rouge prison. Judges found the CNRP’s leader guilty and condemned him to two years in prison in 2011. He was forgiven by royal pardon two years later, but the lawsuit was “reactivated” in 2015 as Rainsy was traveling in South Korea. He has not returned yet, choosing self-exile in France instead. Kem Sokha, the CNRP’s vice-president, has spent the past few months hiding inside the party’s headquarters, refusing to appear in court after being summoned in a controversial case related to prostitution. On September 9, a court convicted him in absentia for failing to show up, handing him a five-month sentence plus a fine. Tensions reached a climax with the murder of Kem Ley, a political analyst and outspoken activist, who was gunned down in July. While there is no solid proof of responsibility, swirling rumors have it that the shooting was the icing on the cake of the ongoing crack-down. Hardly any of this is unprecedented. 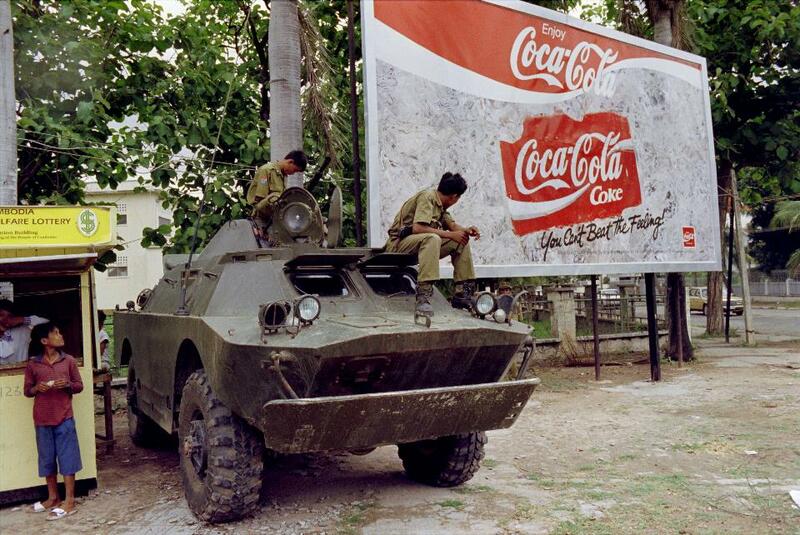 Going back to the end of the Vietnamese occupation in 1989 and the creation of a formal democratic state, Cambodian politics has never been a peaceful affair. Violence marred the administration of the United Nations Transitional Authority in Cambodia (UNTAC) in the early 1990s, and tensions between the then-two Prime Ministers – Hun Sen and Prince Norodom Ranariddh – exploded in 1997, as a bloody coup d’état engulfed Phnom Penh. But some see a difference this time around. For the first time since the putsch, the government appears truly at risk of losing out, as better educated and better informed citizens have grown increasingly resentful of the mismanagement their country is subjected to. There is little doubt that such mismanagement is a real issue. Reports by the media and various NGOs have piled up over the years, detailing the systematic looting of the country’s riches and the injustice suffered by common people. He argues that a political compromise should be sought, with the opposition committing itself not to damage Hun Sen’s and his close associates’ safety as a way to ease a transition, but such a deal is nowhere in sight. Hun Sen has once again raised the specter of civil unrest should the opposition win and remove CPP loyalists from the military and the police. Meanwhile, the opposition has been keen on attacking the government as a Vietnamese puppet – a popular claim, given that anti-Vietnamese sentiments run high in the kingdom. The resulting political polarization raises a number of questions. The first is whether repression will intensify in the coming months or the ruling and opposition parties will manage to find a deal, as it happened in 2013, when Rainsy, who at the time was also in exile, was allowed to return to contest the polls. 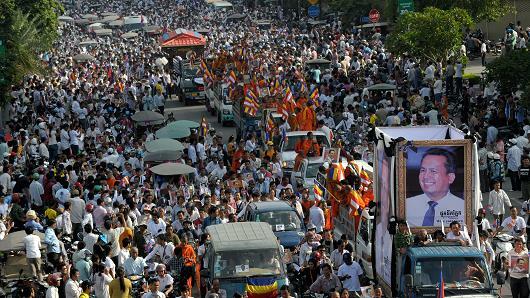 Another is whether the CNRP can win even if the crackdown drags on. Most of those who spoke with Asia Sentinel claim that if the elections are free and fair, the opposition stands a chance, but few are optimistic. From his base in France, Sam Rainsy is out of reach, besides being blamed by some for once again beating a hasty retreat in the face of danger. So is Kem Sokha, a man known for his ability in raising support among the Cambodian rural population, a significant chunk of which constitutes the CPP electoral base. According to Cham Bunthet, another analyst with Politikoffee, even a return of the CNRP’s leader would be unlikely to make a significant difference. “If Mr. Sam Rainsy is allowed back, there will be a political deal and any deal benefits the CPP more than the opposition,” he says. “Maybe they just want to destroy the CNRP. They have taken the head away and are now breaking them into pieces. 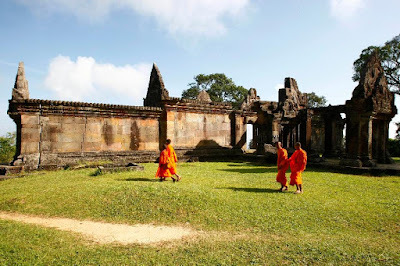 Bretton Sciaroni came to Cambodia in 1993, the year of its first democratic election after more than two decades of tumultuous rule by the U.S.-backed Lon Nol regime, the Khmer Rouge, and then a Vietnamese occupation force. It was a second chance for a country that had only gained independence from France in 1953, and a second chance for Sciaroni. Bretton Sciaroni at his office in Phnom Penh. Photo courtesy of Sciaroni and Associates. In 1987, at age 35, the American lawyer had seen his career very publicly blow up after a seemingly meteoritic rise to the Reagan White House. He had been hired as counsel for the President’s Intelligence Oversight Board, but his luck ran out when he became embroiled in the Iran-Contra Affair that rocked the last years of the Reagan administration. After facing a public whipping in the U.S. press when it was revealed he had failed the bar exam four times, it is perhaps unsurprising that he agreed to an unlikely job in a war-torn country halfway around the word several years later. On the suggestion of Dana Rohrabacher, a Republican congressman in California, the one-time Reaganite was now ironically tasked with helping the formerly communist Cambodian People’s Party run its first campaign as a modern political party. “When I arrived out here, it was a single male-only posting. There were no hospitals, no schools. It was the Wild West in those days. Every cop on the street corner had an AK-47,” Sciaroni said of his early days in Phnom Penh during an interview at his office earlier this summer. 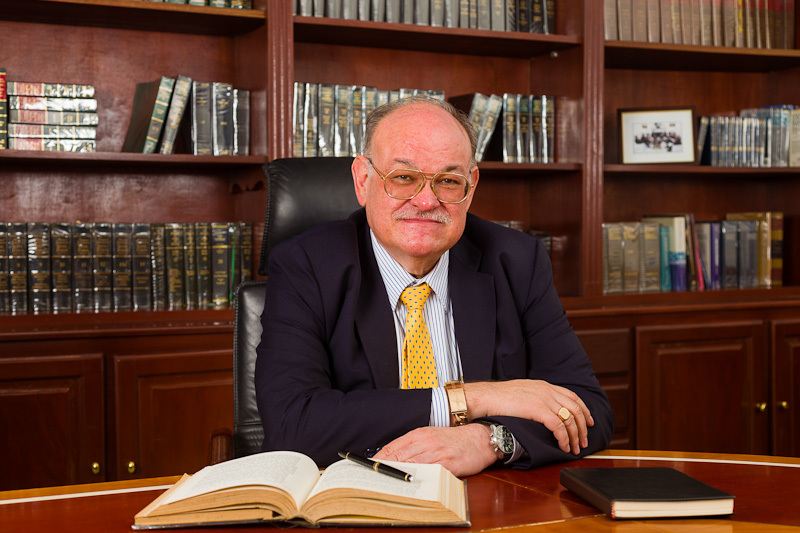 What was meant to be a short term stint would instead set Sciaroni, now in his 60s, on the path to become one of the most powerful American expatriates in Cambodia with the help of his influential law firm, Sciaroni and Associates. He also maintains deep ties with the foreign business community as the head of the American Chamber of Commerce and the International Business Club, and has been a “Legal Adviser to the Royal Government of Cambodia” since 1995 – which carries a rank equivalent to government minister. Sciaroni is in the words of the current U.S. 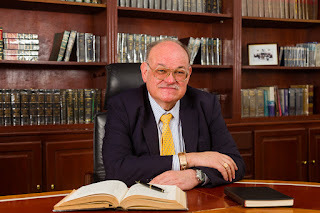 Ambassador to Cambodia, William A. Heidt, a central figure in Phnom Penh’s foreign community: “Brett Sciaroni was one of the first foreign lawyers in Cambodia in the early 1990s, after Cambodian democracy was restored. He has been a pillar of the U.S. business community ever since, promoting U.S. investment in Cambodia through his law firm and in his role as the founder and head of the American Chamber of Commerce,” Heidt said in a statement by email. One of the most common misconceptions about Sciaroni, at least in Phnom Penh circles, is that in his 23 years in Cambodia he is the “lawyer“ (and presumably “friend”) of long-serving Prime Minister Hun Sen, who also heads the Cambodian People’s Party. By Sciaroni’s admission they sound closer to acquaintances, who have worked for the same party but not closely together. 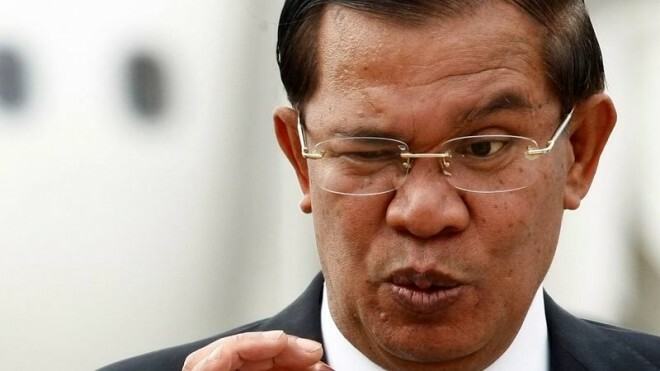 Sciaroni and Hun Sen – who he calls a “fascinating guy” – have more in common than meets the eye. Born approximately a year apart, albeit in very different circumstances, they have both made their careers out of their political staying power and the ability to reinvent themselves. As a former Khmer Rouge commander, Hun Sen has had the unique ability to change with the times and survive. He defected to Vietnam during a period of internal purges in the Khmer Rouge in 1977, and was subsequently appointed to head the Vietnamese-backed regime in 1985 during its ten-year occupation of Cambodia. 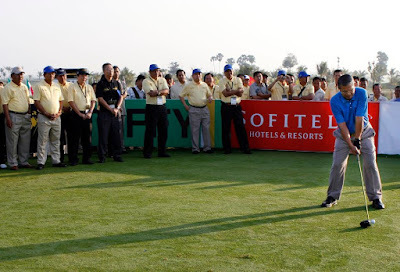 Since then, Hun Sen has reinvented himself yet again as a “modern democratic leader” in the 1990s – some would say a politically repressive autocrat – and is now best known for his love of golf and Facebook. “I have no regrets at all. I was under fire because there were people on Capitol Hill who didn’t like my legal opinion. It wasn’t like I was under scrutiny for having done anything wrong, it was just – for the Democrats on the Hill – politically incorrect to write what I wrote,” he said. The irony of an ex-Reaganite working with former communists was not lost on Sciaroni, although he personally found many former members of the Khmer Rouge to be more pragmatic than political by the 1990s. “They say, and I do believe, they weren’t communist by conviction, they were communist by circumstance. That’s why after the Vietnamese left in the late 1980s, this place changed very rapidly into a free market economy. There weren’t a lot of very dedicated communists,” Sciaroni said of the Cambodian People’s Party. “When I came here, I used to go to party official’s offices, and in those days the bookshelves were full of Marx, Lenin, Engels. But I will bet you, if I took any volume off the shelf, I would have broken the back of the book. It probably had never been opened. These people were survivors, and they went with the Vietnamese not out of conviction but because they had to survive,” he added later. In the private sector, Sciaroni’s firm has also advised U.S. and international business interests entering the Cambodian market. Sciaroni kept mum on which companies he helped, although a 2011 profile of Sciaroni on Salon.com claims they include Chevron, Mistubishi, Japanese conglomerate Mitsui, and Anglo-Australian mining multinational BHP Billiton. “I do quite a bit of informal advice or advice wearing my AmCham hat. For market entry, they need to know not just the legal requirements, but they need to understand something about how the economy works,” Sciaroni said. He also continues to work with the U.S. Embassy on business-related issues, and says they are “both keen on getting Cambodia to commit to a bilateral investment treaty” as well as the Trans-Pacific Partnership. These days, Sciaroni is a fixture at Phnom Penh business gatherings. He is easy to spot with his trademark mustache, retro gold-rimmed glasses, and a flashy gold bracelet. He is typically surrounded by an entourage of associates and individuals hoping to speak with him. Name-dropping Sciaroni prompts instant recognition in business circles, and he maintains a close relationship with the U.S. Embassy. He has pivoted once again, into what may become his final role, as an elder-statesman of Cambodia’s business community. When we launched our latest data-driven investigation nearly two months ago, none of us expected events to unfold as they did. Our report, Hostile Takeover, was the result of a major investigation into the corruption that underpins Cambodia’s economy. It provided the evidence for what most Cambodians suspected but could never prove – that family members of Prime Minister Hun Sen are amassing vast personal fortunes in the country’s private sector. 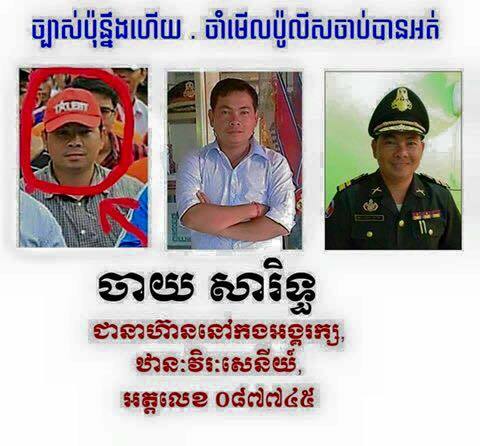 Cambodia is a dictatorship, and is likely to become a dynastic one. In power for 30 years, Hun Sen has overseen the murder, torture and jailing of his critics. His family members hold key posts in politics, the military, police, media, and charities, and his eldest son Hun Manet is being groomed to succeed him. Our report showed how members of the Hun family wield significant control across most of Cambodia’s lucrative industries, with links to major global brands. Some of the domestic companies they are affiliated to have been accused of a litany of abuses, including land grabbing, and violence and intimidation against local populations. The news dominated the headlines in Cambodia for days, and received widespread international coverage, ranging from the New York Times to Buzzfeed. The Hun family response was characteristically cynical. Within hours, three of the premier’s children had already taken to Facebook, accusing Global Witness of politically-motivated lies. Among them was Hun Sen’s eldest daughter Hun Mana. Our investigations revealed how Mana has the largest number of business holdings of any member of the family, with links to or interests in 22 companies which have registered share capital of more than US $66 million, according to filings in Cambodia. Hun Mana posted this image and quote in response to the launch of Hostile Takoever. Photo obtained from Hun Mana's Facebook page. Photo obtained from Hun Sen's Facebook page. On one level these Facebook responses seem relatively innocuous. But they come at a time when the prime minister has civil servants from seven government ministries trawling the internet, especially Facebook, for comments deemed critical of government policy - a project which has resulted in arrests, imprisonment and lawsuits. Hun Sen’s rule is becoming increasingly despotic. He narrowly won Cambodia’s last general election in 2013 among allegations of electoral fraud. A number of laws have since been passed giving the government increased powers to monitor and crack down on its critics, even the opposition party. Opposition leader Sam Rainsy has been in exile in France since a warrant for his arrest was issued last year. It’s unclear whether or not he’ll return in time for the 2018 general election. The media is a major artery of the Hun regime. 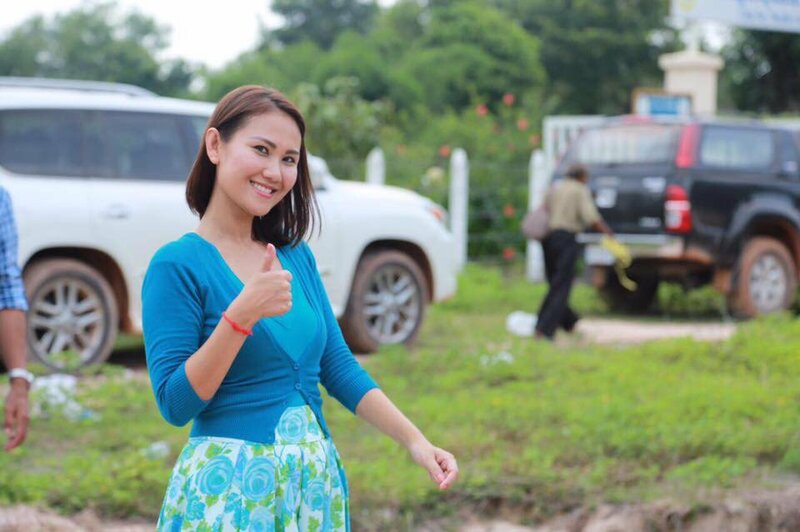 Hun Mana, for example, owns outlets which broadcast across radio, TV and newspapers and are some of the leading mouthpieces of her father’s Cambodian People’s Party. On Facebook she expressed her hope that independent Cambodian newspapers the Phnom Penh Post and Cambodia Daily would be held “liable” for covering the report findings. While much of the country’s media was either under government control or too nervous to appear to be criticising the Hun family, both the Post and the Daily had reported on our findings in full. 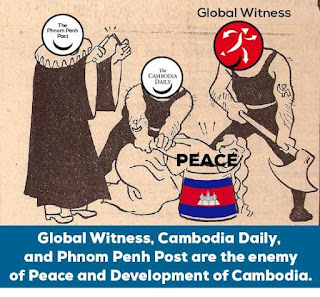 Later in the day, the pro-government Fresh News website published an anonymous letter and accompanying cartoon which highlighted the culture of intimidation and fear surrounding freedom of expression in Cambodia. The cartoon was a doctored version of Nazi propaganda from 1943 showing Roosevelt and Churchill helping Stalin to execute a woman who symbolised peace on a ‘Jewish chopping block’. In this version, the war-time leaders were replaced with logos of Global Witness, the Phnom Penh Post and Cambodia Daily, with the Star of David substituted for the Cambodian flag. The accompanying letter threatened to kick both media outlets out of Cambodia. Image published on the Fresh News website on 7th July 2016. We had expected our report to be met with denial and scare-mongering, but no one was prepared for what came next. Three days after launch, a prominent political commentator and government critic, Kem Ley, was shot dead in broad daylight at a Phnom Penh gas station. Contrary to some reports, Kem Ley had not been involved in our investigation - we had never even been in touch with him. 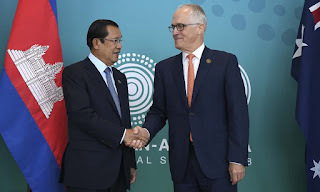 He had, however, been contacted for comment on our findings by a number of news outlets and had given interviews to Radio Free Asia and Voice of America, saying how these revelations would benefit the Cambodian people. Kem Ley’s death was a tragic reminder of the fragility of many of the freedoms that we campaign for. He had worked tirelessly and courageously to defend Cambodians’ rights to express themselves freely and hold their government to account. 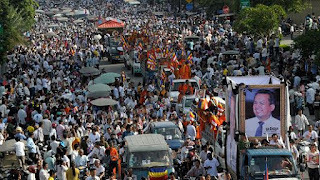 On the day of his funeral tens, if not hundreds, of thousands of people followed his body through the streets of Phnom Penh amid widespread calls for an independent investigation into his murder. "If I Kem Ley die, wipe your tears and continue to walk forward". For our part, we’ll continue to contribute to Kem Ley’s legacy. To this end, we have made the data that informed our investigation into an online searchable database. Cambodia Corporates contains information on who owns, controls or has major stakes in companies in Cambodia, shedding light on the wealth and influence of a small elite. Already almost 2500 people have used the database - able to access company ownership data easily and securely for the first time. We hope this will assist Cambodians in their struggle for justice, by helping them to access the information they need to hold their political and business elites to account. Thousands of people take part in a funeral procession in Phnom Penh on July 24, 2016 for Kem Ley, a Cambodian political analyst and pro-democracy campaigner who was shot dead in broad daylight on July 10. 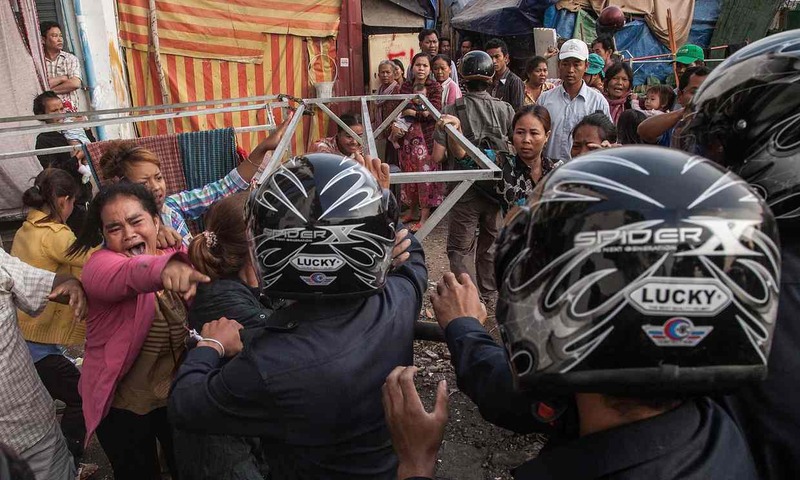 Kem Ley's murder sent shudders through Cambodian civil society in a country already bristling with political tensions and where activists are frequently threatened by powerful interests. Cambodia, one of Asia's fastest-growing economies, is at a tipping point amid an environment of volatile politics that threatens to disrupt the country's move to democracy and put its key industry in the firing line. At the center of events is the murder of a popular political commentator. Government critic and analyst Kem Ley was gunned down on July 10 in broad daylight at a Phnom Penh coffee shop. A suspect was quickly arrested and confessed to the crime, but speculation has remained high that it was a political assassination. Kem Ley was known for criticizing both sides of Cambodia's polarized political landscape, which is dominated by the ruling Cambodian People's Party (CPP) and the opposition Cambodia National Rescue Party (CNRP), but the lion's share of his reproval was aimed at the former. Widespread protests erupted following his murder, and human rights groups such as Transparency International have called for an independent investigation. "Cambodia's politics have veered dangerously out of control," Joshua Kurlantzick, senior fellow for Southeast Asia at the Council on Foreign Relations, warned in a note last week. "The government's brutal tactics of the 1990s and early 2000s, when political activists were routinely murdered and opposition parties nearly put out of business, have returned." Cambodia has a deep history of politically-motivated violence, stretching from the Khmer Rouge's totalitarian regime in the 1970s up until as recently. Last October, when two opposition parliamentarians were brutally attacked outside the National Assembly building, with Human Rights Watch warning that the act bore the hallmarks of an operation carried out by state security forces. "Politics is at a critical juncture, the current situation is an absolute shamble," Jonathan Bogais, associate professor at the University of Sydney, told CNBC, of the currently volatile situation. 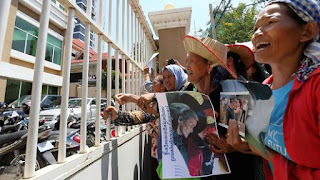 August 15, 2016: Activists protest outside the Phnom Penh Municipal Court calling for the release of two prominent land rights activists Tep Vanny and Bov Sophea. 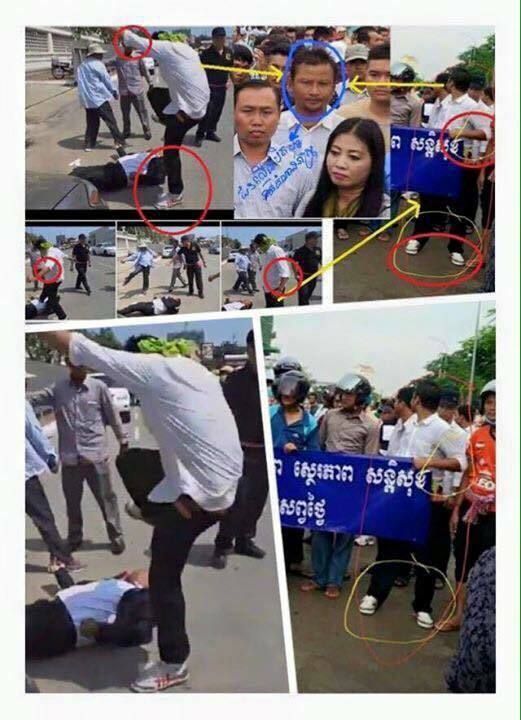 The two were arrested by authorities for insulting a public official and sentenced to jail. The CPP, led by Prime Minister Hun Sen, is one of the world's longest-ruling parties, having governed Cambodia since 1979. But the regime is synonymous with allegations of corruption, fraud, censorship and human rights violations. Justice Minister Ang Vong Vathana was named as a shareholder in an offshore company incorporated by law firm Mossack Fonseca in the Panama Papers leak. Opposition leader Sam Rainsy of the Cambodia National Rescue Party (CNRP), who has been in self-imposed exile in France since 2008 to avoid arrest on an old defamation conviction, called Kem Ley's murder an act of "state terrorism" in a Facebook post on the day of the killing, leading PM Sen to sue Rainsy for defamation. According to The Cambodia Daily newspaper, the most recent suit was the third defamation case filed against the opposition leader in the past year alone. Undeterred, Rainsy doubled down on his accusations on August 1 with another Facebook post, warning that the government was responsible for as many as 18 killings since 1997, The Cambodia Daily reported. Recent developments indicate the country's transition toward two-party politics has seemingly collapsed, leaving young Cambodians with no outlet for grievances and creating a potentially explosive situation, Kurlantzick said. In 2013, the CNRP nearly defeated the CPP, an outcome that had raised hopes for a more democratic system. The CPP has since promised reform and dialogue but progress has yet to materialize. "More protests could be likely as people get fed up of corruption, and further violence is the worst-case scenario," Bogais agreed. "There is a strong consensus among young people that there is a need for change." Even with 2018 general elections on the horizon, the CPP is likely to emerge victorious despite suspicions over the murder case and general disillusionment with its autocratic regime. "The opposition is dysfunctional. They've never been able to have any form of cabinet or shadow ministry and Rainsy, residing in France, has little role to play in politics," explained Bogais. "Even if new parties were to emerge, the PM would ensure their failure." Political tensions were to blame for the closure of more than 70 garment factories this year, nearly equal to the number of factories that opened in 2015, the Garment Manufacturers Association in Cambodia (GMAC) told local media on Tuesday. The production and exports of garments, ranging from footwear to apparel, is one of Cambodia's key growth drivers and economists have long warned the government to diversify away from the industry. "I think the political situation has affected business, both businessmen and investors. When one country has instability in politics, it is difficult to make investments and there are concerns, especially from buyers," the Khmer Times quoted GMAC operations manager Ly Tek Heng as saying. Moreover, only 20 new factories have opened so far this year, he added, noting a near-30 percent drop in orders from buyers. If the closures restricted garment producers' ability to meet their orders, deterred investors or resulted in a visible impact on export growth, they could pose constraints to Cambodia's B2 sovereign credit rating,Moody's analyst Anushka Shah said. Should political tensions continue for a prolonged period,resulting in a policy deadlock or distracting the government from economic reform efforts, that would also pose credit constraints, Shah warned. Bogais explained, "The [garment] industry is run by partnerships with the government and companies set up by foreign investors so if there's a fear of political unrest, no doubt foreign investors will rethink their presence."